The whole work, though including some (rather mild) critical assessments of some aspects of Sai Baba and his organization, leans unduly towards a kind of appeasement of Sathya Sai devotees. She is, of course, herself of Indian origin and has made known through her mails to me that she has friends among Sathya Sai devotees. Though I present some of her welcome criticism of the Sathya Sai organization here, her work is very largely in support of the so-called “Sai spiritual movement” as one having an essentially universalist religious import and as inspiring many to social work and charity. She does not explain why Sai Baba rejected – and was rejected by – the inter-faith movement everywhere (despite vain attempts by some followers to engage with these bodies), as well as all UN organizations they approached. She ignores the many facts that show that the ‘teachings’ of Sathya Sai Baba are mainly Hindu doctrine, and she makes no room for Buddhist or Islamic ideas of any note (all that diverges from his Vedic-based viewpoint is ignored totally). Nor is the SB representation of Christianity in accordance with historical facts nor with many of the deeply held beliefs of Christians (especially the ‘only true Saviour’ thesis). 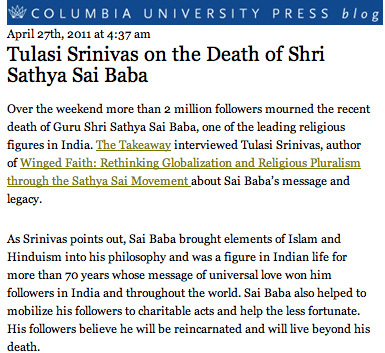 Tulasi Srinivas shows how much she endorses Sathya Sai Baba - perhaps she has an explanation of his vast secret hoarding of precious metals, currency notes, precious diamonds, huge quantities of goods, including perishable dried fruit and biscuits beyond their sell.by dates in caches under his vast bed and many other secret places. If so, she is very silent now! Srinivas mostly adopts the false neutrality of a semi-apologist in partial disguise – fence-sitting or dissimulating where genuine issues of the supposed truthfulness and validity of Sai Baba’s doctrines and actual behaviour arise; she tries to defuse issues by a bogus claim that the truth of many disputed facts are merely a matter of differing ‘interpretation’ of them by the opposing parties, as evident from the following direct quotation from her book:- “Anti-Sai activists argue that the sexual behaviour (if it did happen) is criminal behaviour, while devotees argue that it is a pathway to spiritual betterment. I suggest that these two versions of truth are both valid to the participants” (ibid., p. 269).” Here she adopts the biased generalization ‘anti-Sai activists’ which was introduced by the most aggressive and defamatory critic of all dissidents. Those diverse and independent persons branded by Srinivas as a group include both ex-devotees and independent critics who also have divergent views on various aspects of Sathya Sai Baba and the many issues at stake, each according to their various experiences and sources. This is simply too amateurish from a professor. Facts are either facts or not, interpretations are another matter. That she is far from being a hard-working researcher with any eye for detail and ability to incorporate anything like the full scope of the issues central to any assessment of SB and Co. became all too obvious during her lengthy e-mail exchanges with Brian Steel, Barry Pittard and myself. She asked lots of questions which could have been answered by a simple search of book indexes, not to mention Google and other search engines, but usually ignored the detailed information she received in return. She also failed to provide the correct URLs of the materials of mine which she asked for from me, instead printing long-defunct URLs instead of the correct ones sent to her (one may wonder why?). Among her sins of omission is the remarkable avoidance of one of Sathya Sai Baba’s most active opponents, the Indian Sceptic’s Basava Premanand, subsequently also the award-winning Profesor Narendra Nayak’s exposures. Further, she obscures numerous prominent Indian critics of Sathya Bai Baba through the decades, such as Professor Narasimhaiah of Bangalore University, nor the exposure of Sai Baba by the famous stage magician Abraham Kovoor.